Adding a new pool or spa is the most exciting way to add luxury and value to your Boynton Beach property. A custom built pool is essential to enjoy the South Florida lifestyle truly.. You must choose an experienced designer and builder of Boynton Beach new pools and spas to help you create the perfect backyard oasis. The best Boynton Beach pool contractor for your project will provide you with an expert consultation to help pinpoint your important needs and wants to create the ideal pool or spa to fit your home and budget to ensure years of satisfaction. 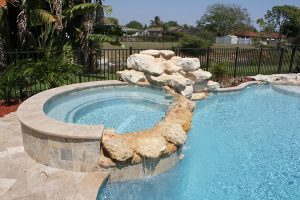 The Boynton Beach new pool and spa professionals at Treasure Pools and Services offers over 30 years of pool design and construction experience to create an outdoor paradise friends will love, and neighbors will envy. In fact, Treasure Pools and Services has earned the coveted A+ Rating with the Better Business Bureau due to their strong commitment to customer satisfaction. Homeowners have trusted Treasure Pools and Services to develop and build Boynton Beach new pools and spas in many of the most luxurious communities including Artesa, Canyon Springs, Valencia Cove, Borgata, Equus, and Le Palais just to name a few. Many satisfied customers refer friends and relatives to Treasure Pools and Services for all of their new pool and spa building, pool remodeling and resurfacing. Envision your perfect water feature, swimming pool, jetted spa, and outdoor kitchen and let licensed pool contractor Joseph Palma and partner Craig Cohen make your dreams come to life. There’s no better way to enjoy the warm, sunny Florida weather than with your own Boynton Beach new pool or spa. Call Treasure Pools and Services now at (561) 793-1550 for an outdoor swimming pool and living space to create family memories you’ll treasure.